All About Solenoids - INJOY LURE COURSING EQUIPMENT....When you want the best, buy INJOY! Starting in the Fall of 2006, Tom started hearing from his customers about premature solenoid failures in the lure machines. In some instances, they were not lasting through the first day of use. After six months of the reports increasing in frequency from his customers, he decided that he needed to get smart about what solenoids should be used in a lure machine that would give good service and an acceptable life. The solenoids pictured below are the typical ones used on lure machines for the past 35 years. They are automotive types used in cars and trucks to activate the starter motor to start the engine of a vehicle....we are using starter motors in our lure machines, so why not use the same solenoid used in a vehicle. As my wife loves saying to me, "not so fast, buffalo breath!!!" Generally, these solenoids are classified as 100 Amp, intermittent duty solenoids. The solenoid that INJOY had been selling for the first 10 years, was a Prestolite #SAZ4201N. 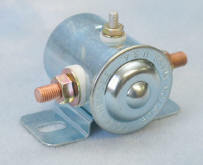 You can view the specs for this solenoid at solenoid specs. This is a very good automotive soleniod but with the stated "max on time" of 2 minutes (and an unstated "off time" of probably 10 or 15 minutes), it just does not hold up with the type of use that we give it on a lure machine. During his search for a better mouse trap, Tom found that all of the solenoids intended for automotive starting circuits had a similar duty cycle and rating. This is probably why we have been plagued with solenoid problems at various times in the past. People have felt free in the past to say "this solenoid or that solenoid has lousy quality," when in truth, we have been asking the automotive type solenoid to do a job that it was never designed or intended to perform. What Tom found during his search was that there are all kinds of solenoids used for switching on/off various DC motors used in commercial and industrial applications. These solenoids are classified as continuous duty and are rated at 100 or 200 Amps. They are designed to be switched on for long periods of time to activate DC motors that run hydraulic pumps for snowplows, lift tailgates and winches on tilt bed tow trucks...on, and on. These same motors are also what INJOY is offering for sale as the TB1225 and TB1248, but are being manufactured for INJOY with long shafts. Because of price considerations, the solenoid we are now selling is a private brand (probably manufactured in China) and is not a Prestolite solenoid. It does have the same rating as the Prestolite specified here. It is a 200 Amp solenoid rated as continuous duty. Only time will tell if this solenoid is what we need to end the short life cycle and lockups experienced in the past. To date, INJOY has been selling these solenoids for well over 8 years and the performance and longevity has been excellent!